It started with an overnight stay at Divine’s Emporium and a high school computer programming assignment. Athena found an unusual video camera, hooked it up to her computer, and videotaped her cousin, London, whom everyone called Doni. She thought nothing of it, after all the other odd events of that night. After all, Neighborlee, Ohio was the weirdness capital of the United States, and Divine’s Emporium was the caretaker, the way to control all that weirdness and keep the magic tamed. At least, that was what everyone who saw the strange things and people and events chose to believe. Three years later, in an experimental computer class in college, Athena and her teammates chose to create a social media site as their project. The site, called FlopDrop, needed a hostess. Doni agreed to be the foundation for all the images of the hostess, whom they named London Holiday. To the surprise of the team and the class--and the disgust of their rivals and enemies--FlopDrop took off. London Holiday and her CGI friends became overnight Internet sensations. London seemed to take on a life of her own. By the time Athena and Doni realized that their artificial person had become a self-aware Artificial Intelligence, they weren’t quite sure what that harmless experimentation three years ago had created. Were they midwives at the birth of a new lifeform…or repeating Dr. Frankenstein’s mistakes on an even bigger scale? 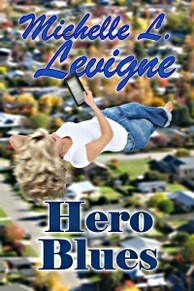 Superheroes have it rough -- especially when the towns they protect expect them to fix everything, from forgetting to fill their gas tanks to children running wild to the consequences of a lack of common sense. Jane is finally fed up with being the Ghost, notifies the citizens in her town of mental midgets that she’s quitting, and sets off to make a new life and solve some mysteries of her own. First item on the list: return to Neighborlee, the town where she was found as an abandoned child. Jane knows there are others like her: abandoned children with unusual powers. Where did they come from, how did they get to Neighborlee and other towns like it, and why are the Gifted -- as they call themselves -- the way they are? As Jane retraces her childhood, she is pleased to discover that some people remember her. She settles in, makes a new place for herself, and is welcomed by the people and the town itself. That’s important, because Neighborlee protects its own -- and those who don’t fit in are soon driven away. She makes contact with others like her and slowly earns their trust and confidence. However, it’s a bumpy process. Living in the “weirdness capital of the United States, possibly the world,” means being extra cautious. Even when it comes to someone with superhero powers. Or maybe especially someone with superhero powers. Then someone -- or something -- from outside her understanding makes contact. It or he or they promise Jane not only answers to the questions she’s had all her life, but a way to go home, wherever her real home might be. It’s everything she’s ever wanted … or is it?